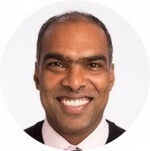 Sajan George is the Founder and Chief Executive Officer of Matchbook Learning, a national nonprofit charter school turnaround management organization launched in 2011 to turnaround our nation’s bottom 5% schools with a unique blended, competency based turnaround school model. Matchbook Learning has launched, and manages, three school turnarounds in Detroit, MI and Newark, NJ. Matchbook Learning is now building an Accelerator to help other schools around the country replicate their turnaround model and methodology via its open sourced technology platform “Spark”. Prior to founding Matchbook Learning, Sajan was a Managing Director with Alvarez & Marsal (“A&M”) where he led the firm’s Education Practice. In that role, he co-led a diverse group of talented turnaround professionals across the U.S. in turning around entire K-12 public school districts in St Louis, New Orleans, New York City, Washington DC, Detroit, etc. Sajan’s entire career has been involved in turnarounds – first with large corporations, then large urban school districts and now finally individual schools. Sajan has a deep sense of calling around the need to turnaround public education in America. Leaving the for-profit corporate turnaround world in 2011 to launch a non-profit school turnaround organization was both a massive leap of faith and yet an inevitable progression in his calling. Sajan, in 2015, moved his wife, 3 children — Michav (12), Seth (10) and Isa (7) — along with the family dog, Titan, from Atlanta to NYC to continue the adventure and dream. They are active members in their local church and enjoy traveling extensively, reading voraciously and experiencing new people, cultures and foods.